Strathfield Park is a must visit after the amazing renovation. If you haven’t had the chance to go yet, keep it in mind for surprising your kids next school holidays. Did you know that Strathfield Park is one of Sydney’s oldest and best mantained parks? 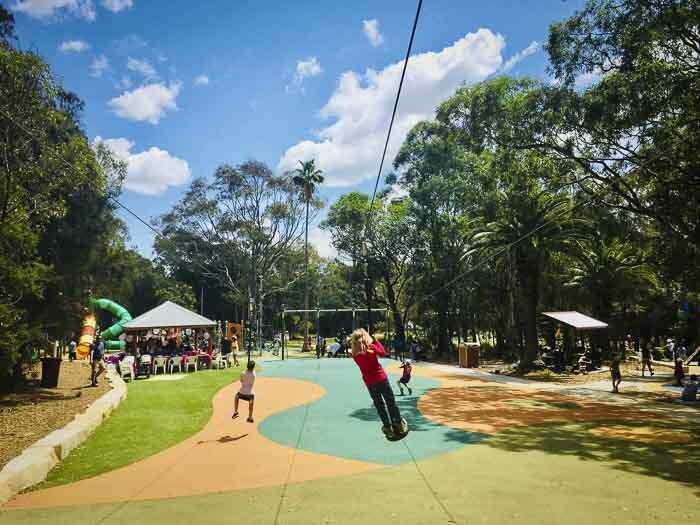 Strathfield Park has always been very popular in the neighbourhood and surroundings because of its wide range of sporting and recreational facilities. After the upgrade, it is attracting parents and kids from other Sydney areas too, quite rightly. Inner West parents and locals are so lucky to have Strathfield Park! One of the best things about Strathfield Park is that the picnic shelters and barbecues are next to the playgrounds. Sometimes, we –parents- only need a good park to let the kids run wild, meanwhile we take it easy. In Strathfield Park, kids cannot be bored. The park has two playgrounds and a bike track. Furthermore, the equipment of all the playgrounds is seriously good. The only drawback of Strathfield Park is that it is not fenced, although it has relatively quiet residential streets surround it. Both playgrounds are located close to the road, so if you have little children, you will need to keep a close eye on them. 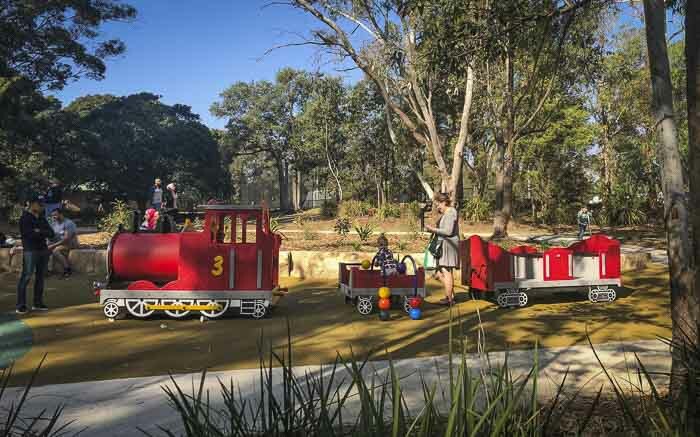 Strathfield Park has so many play areas that your kids will be begging you to take them back. For toddlers and pre-school aged children, the best playground is the one on the Chalmers Road side. Besides being suitable for young children, it is also a disability access playground. It has several swings and a main structure with a little slide. For young and not so young children, the playground of Homebush Road side is sensational. With several play areas that occupy an area of 225 square meters, the equipment is diverse and has been cleverly designed for all abilities. Not only older kids can enjoy it but also the little ones. For us, it meant that my three daughters could play in the same place for hours! My daughters loved it, and so, I did. The adventure play area is a winner too. 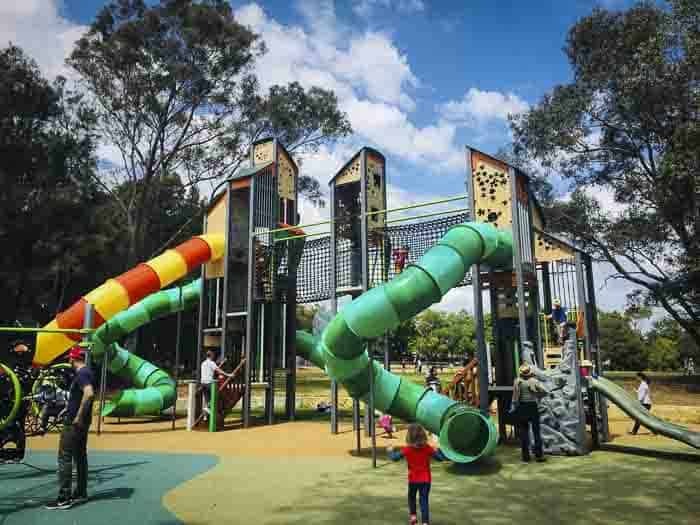 With three sky towers, three big slides, a climbing net and wall, and triple flying fox, your children will probably spend most of the time in this area, mine did. 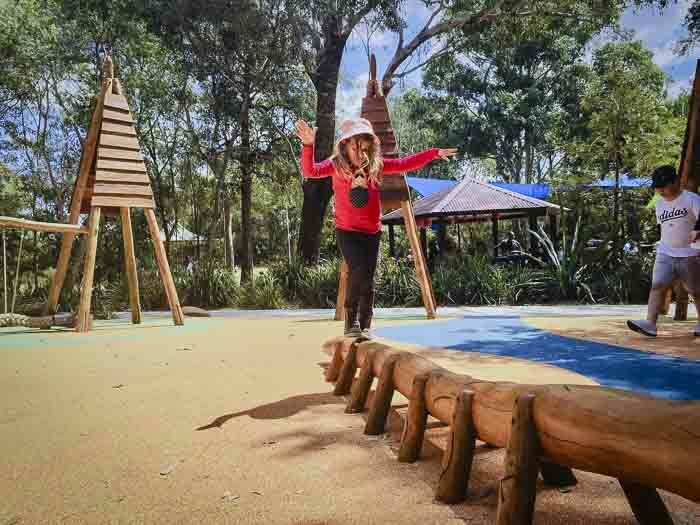 The nature inspired play area with the tepee theme was one of the favourite areas of Strathfield Park, too. My daughters really liked to play in the teepees. Towards the flying fox, there is a huge seesaw and a big merry-go-round. Also, there are some musical instruments, a big xylophone and drum. The cubby house towers and sensory play area is the best one for summer, as some sails protect it. 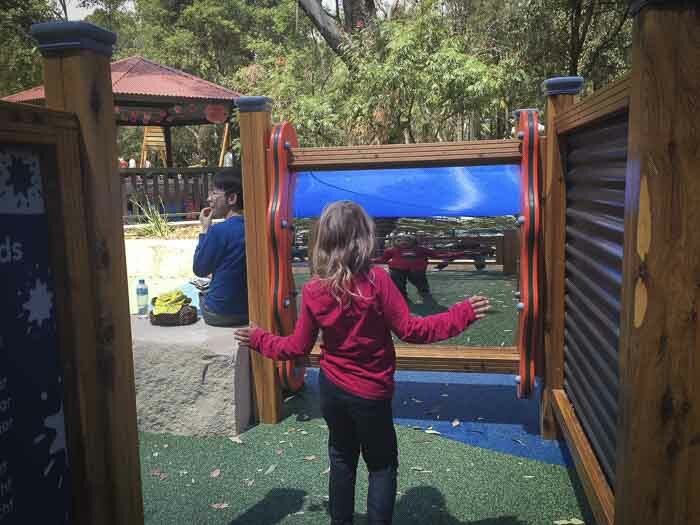 Besides the cubby house-towers, there are several suspension bridges and slides and a small merry-go-round for the little ones. The playgrounds of Strathfield Park would not be first class without a good range of swings. I think that it has all the possible types: a large rope hammock, a nest swing, baby swings and a swing for kids with disabilities, besides the one of Chambers Road side. The synthetic hills are ideal for little explorers! Finally, the bike track is fantastic. 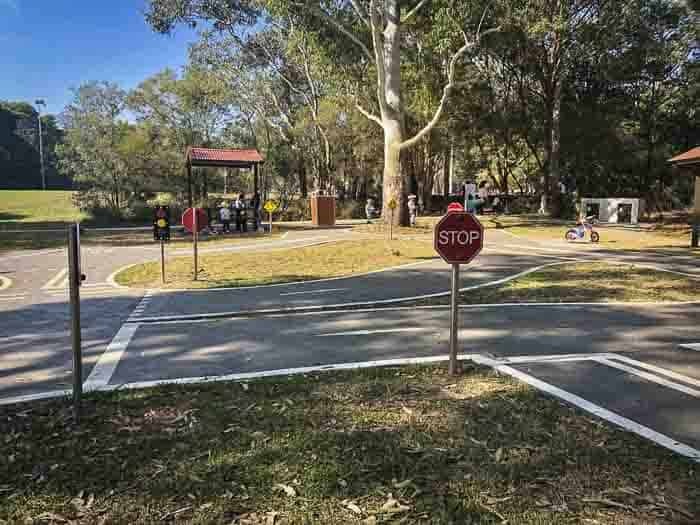 It is designed for little children, so this is probably why it is next to the playground on the Chalmers Road side that caters toddlers and pre-school kids. Other facilities: Synthetic and grass sporting fields sporting fields (used for cricket and soccer), night lights for sporting fields, basketball, netball and volleyball courts, change facilities, rotunda, several barbecues and picnic shelters. Nearest takeaway coffee: BYO. The kiosk is only open when there are sporting events. The kiosk is adjacent to the toilets block in the middle of the park. At the weekends, there is usually a van parked on Homebush Road, which sells coffee, ice cream and some snacks. Bring cash, as they didn’t have EFTOS when we went to the park. Shade: Some areas of the park are more exposed than others, but in general there are lots mature trees and several shade sails. 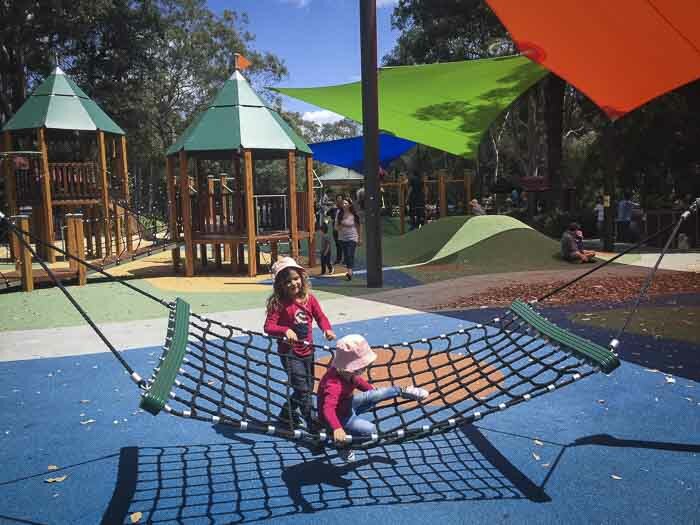 Mum’s report: Strathfield Park is a paradise for families that have super active kids. The park offers a big variety of playground equipment. Kids can play in the park for hours. Therefore, pack your picnic rug and some food, and let the children to burn some energy. Grab a take away coffee before going during the week or have cash ready for the coffee van at the weekends, as the kiosk is not always open. Also, if you have young kids, don’t forget the bikes or the scooters. The bike track is really good, too. Extra: Strathfield Park hosts major events such as Carols by Candlelight, Australia Day and Strathfield’s Movies in the Park. For more information about these events, check the Strathfield City Council web page. Nearest station: Strathfield station. Then, bus route 483 or 480. Please, check always the Opal app or the information of Transport NSW web page before catching public transports as there could be some changes. Bus stop nearby: Number 480 is the closest stop. Please, check always the Opal app or the information of Transport NSW web page before catching public transports as there could be some changes. Parking: Plenty, although it can get busy at the weekends. Best streets to park are Homebush Road and Chalmer’s Road. Both have disabled access parking available. It is not a secret that Strathfield Park can get quite crowded on Saturdays and Sundays and, of course, during school holidays. But, even the weekend crowds, I have always managed to find a car park spot on Chalmers Road. Strathfield Park made into our top 10. The new upgraded playground is simply amazing. It is perfect for the ages of my 3 daughters. Happy kids, Happy parents! Which is your favourite playground?